First, the confession. I must have the world’s worst sweet tooth! Chocolate, cakes, biscuits, you name it – if it’s sweet it’s got my name written all over it. So, it was with delight that I read last week that Radovljica has now got its own cake and therefore I hastily arranged a tasting. The idea for Linhart’s cake (Linhartov cukr), as it is known since Radovljica is the birthplace of the first Slovene dramatist and playwright Anton Tomaž Linhart, came about during conversations held in Lectar Inn between its proprietor, Jože, and locals who recalled how in days gone by in Linhart’s era, local school children used to come to Lectar for cake. And so the idea to try to recreate and revive this tradition was born and Jože and his team at the Lectar Inn set about trialling and testing recipes, based upon traditional recipes, until they were satisfied with the result. The cake was launched at a special event on St. Valentines Evening and from now on will be available daily, to eat in or take-away, at Lectar Inn. The cake, which has become a talking point about town, uses only natural ingredients, comprises a light sponge base topped with a moist apple layer, using organic locally grown apples, and finished with a light cream icing. A silhouette of Linhart is then added to the top for decoration and to mark it out as Linhart’s cake. You can see me indulging, or about to indulge, below, with a little drop of (medicinal!) blueberry schnapps! It was yet another snowy night when I visited Lectar, so it felt great to be somewhere warm and hospitable, enjoying good food and company and momentarily forgetting about the blizzard outside. It has been another week dominated by snowfall, which I for one, really hope will end soon as it’s about time spring sprung! 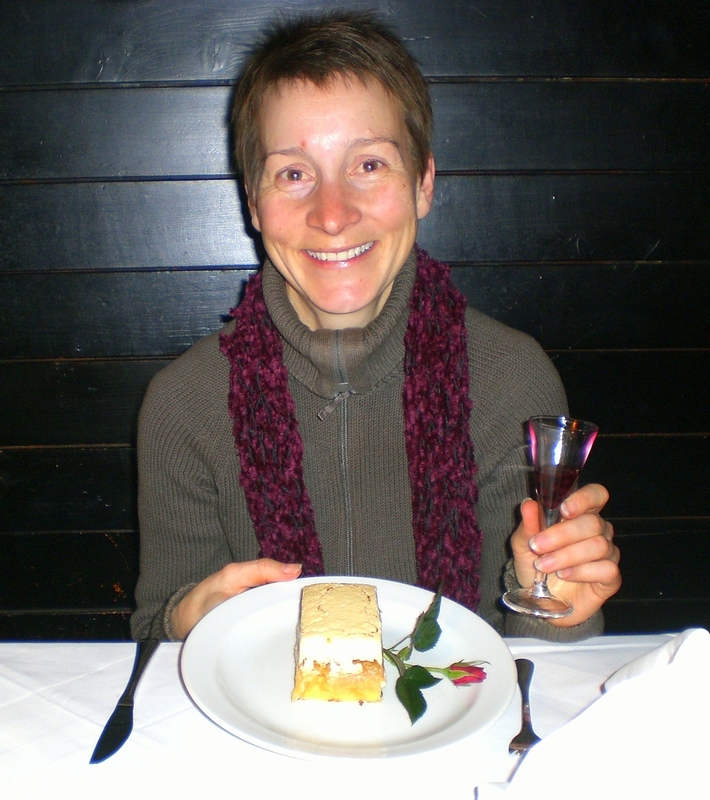 I’ve managed a couple of walks up to Talež (see my previous blog entitled ‘Sporting Slovenia’) which have involved wading through knee-deep snow – pretty to look at but exhausting – still, helps to burn off all that cake! 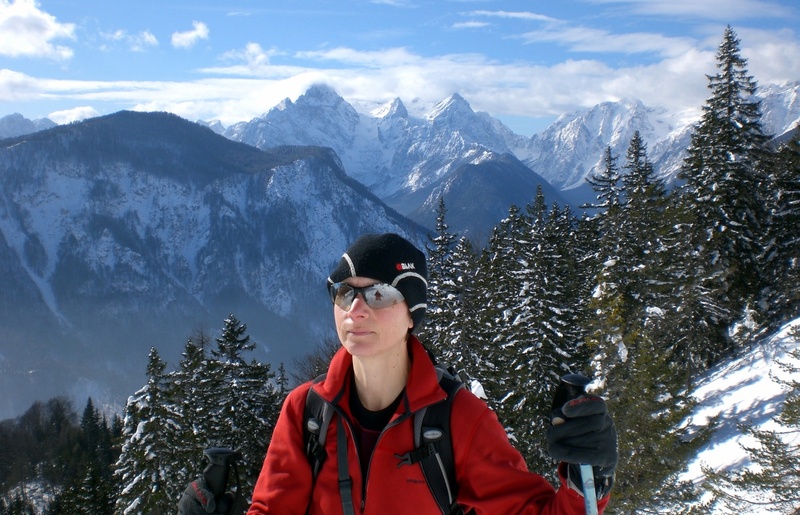 Lovers of winter sports are in their element in Slovenia this year with plenty of snow at all the major ski resorts, numerous tracks for cross-country skiing and also several good mountain roads, which have been prepared into sledging tracks. I, unfortunately, am not keen on any of these sports but I do enjoy winter hiking if the snow conditions are right and if it is a nice sunny day – as it was on Saturday. Well actually, here in Radovljica it was somewhat cloudy but that’s one advantage of living close to the mountains, if it’s cloudy down here in the valley, it’s more often than not sunny up above, so with a little effort you can soon be up enjoying the warmth of the sun, relishing the views and reaping the rewards of ones effort. Having spent 20 minutes shovelling snow to clear a parking space (that’s winter in the Alps! ), the walk towards Dovška Baba began. The peak of Dovška Baba (1891m) is part of the Karavanke Alps and is most directly reached from the village of Dovje. This is a walk I do a good few times a year and always usually go to the top, from where there are stunning views in all directions, towards Slovenia on one side, and Austria on the other. However, with the current amount of snow it took longer to get just half-way up than it would usually take to get to the top and back. But it was just so lovely to be outside and to feel the warmth of the sun and being there, up above the clouds it was almost like I had momentarily entered a different country, or at least a different season. Of course I wasn’t alone in seeking the sun and some snowy fun, there were quite a few people walking up with skis or snowboards on their backs, some snowshoeing and also quite a few others dragging their sledges up, in order to enjoy the rapid descent. This photo, taken on the way up, shows the views over the Julian Alps and to Triglav, Slovenia’s highest mountain (2864m). Radovljica is sandwiched between the Karavanke and the Julian Alps, so there is a wide range of choice for all kinds of sporting activities, both summer and winter, for adrenalin seekers or for those wanting a more gentle experience or just to enjoy the views, and all within easy reach. Radovljica is in the region of Gorenjska, which is also home to Slovenia’s only national park, Triglav National Park. Triglav National Park (TNP) is named after Triglav, the highest point in the park, whilst the lowest part is the Tolminka Gorge at 180m. TNP extends along the Italian border and close to the Austrian border in the north-west of Slovenia and covers 880 square kilometres, or more than 3% of Slovenia. Two-thirds of TNP is covered by forest, the predominant species on the south side being beech whilst on the north side spruce and larch trees dominate. In fact, wherever you go in Gorenjska you won’t be far from a forest since ¾ of the region is covered by it. 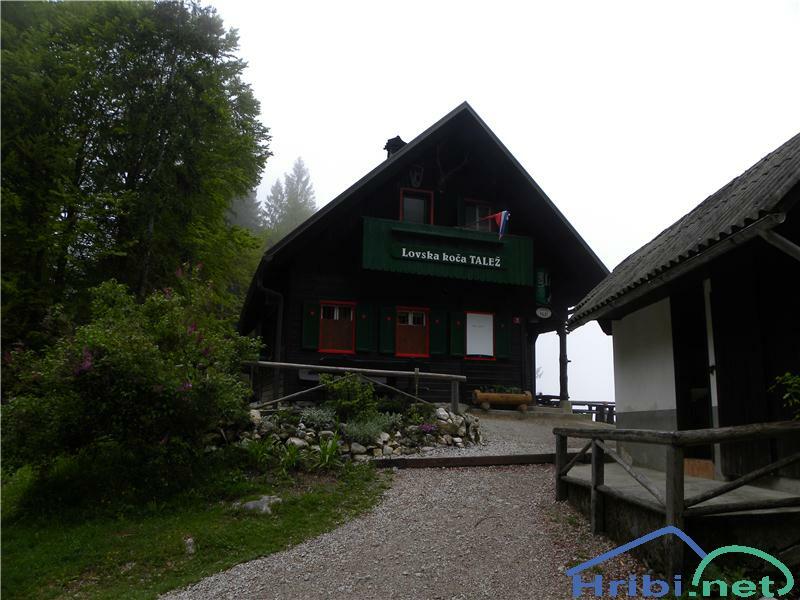 A fun, and different, experience for hikers wishing to stay overnight, is to stay in one of the mountain huts within the park. A stay is a good way to sample a bit of the real Slovenia – just don’t expect too many home comforts – but a bed and a home-cooked meal is often all you need after a long day of hiking. I’ve spent quite a few nights sleeping in various huts and its always an interesting experience! • Joy (getting invited somewhere, a hope of meeting new people) and dejection (see despair). Friday was a public holiday – Prešeren’s Day, which is celebrated in the memory of the death of the great Slovene poet, France Prešeren. I went to Kranj, the capital of the Gorenjska region and just a 20 minute drive from Radovljica, where every year on the 8th February the Prešeren Fair takes place. All around the old town there are links to him including: Prešeren Grove, the cemetery where he was laid to rest, Prešeren Theatre, Prešeren Monument, Prešeren Street, with its Gothic and Baroque townhouses and Prešeren House, now a museum, and where the poet spent the latter years of his life and died. The fair combines a street market with re-enactments of traditions from Prešeren’s times; clothing, music, dance etc. and its always really busy and buzzy. I have been for the last three years and it’s always a pleasant and different way to spend a couple of hours. On Saturday it was carnival time in Radovljica! Well not just in Radovljica actually. The tradition of ‘Pust’ is a celebration of the harsh winter giving way to spring and a new cycle of farming and nature, though personally mid-February seems a bit optimistic to celebrate this when the snow covered land stills feels incredibly wintery to me! I can but hope that someone, somewhere up there is taking note and it might actually stop snowing soon! A number of events take place across Slovenia for the Pust Festival. The largest Pust Carnival takes place annually in Ptuj from 3rd – 12th February where up to 150,000 people attend the 100 or so events taking place during the carnival period. 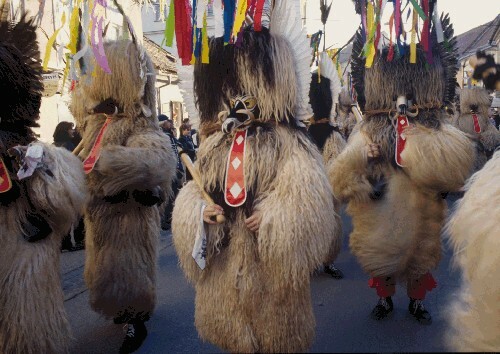 The second largest carnival takes place in Cerkno. Pust is synonymous for its ornate costumes and masks (pictured below) with each region having its own variations, customs and habits. If you happen to be in Slovenia during this period, perhaps on a skiing holiday, you should take some time out and go and visit one of these carnivals, wherever you are, there is bound to be one happening near you. Here in Radovljica, the Pust procession took place on Saturday. Children from the local area all get dressed up in costumes and parade through the town and the streets are lined with people cheering them on. On Pust Tuesday, children get dressed up in costumes and masks in what resembles a curious mix of Halloween, complete with trick-or-treating, and Pancake Day, albeit with doughnuts being eaten rather than pancakes! Not wishing to be a party-pooper, and of course in keeping with tradition, I did my bit by munching through several doughnuts too! I remember shortly after having moved here, seeing children dressed up and going from house to house however at that time I didn’t know what it was all about – I assumed they must celebrate Halloween in Slovenia in February! I thought I would start this week’s blog by writing about some of the upcoming events happening in Radovljica and elsewhere in Slovenia in the coming months. Of course this is just a small selection of events and I will endeavour to keep blogging about more interesting events as and when I come across them and posting reports and photos of those which I attend. I’ll be noting them in my diary – I hope you will be too! There was more sporting success for Slovenia last weekend when Tina Maze won the slalom at the Women’s Golden Fox (Zlata lisica) event and came second in the giant slalom – just missing out by 0.08 seconds. The Golden Fox event is held annually at the Maribor Pohorje ski resort and so her success was even sweeter in front of a very enthusiastic home crowd! Additionally, ski jumper Robert Kranjec won his first World Cup victory of the season in Norway. Ski jumping has traditionally been considered a male sport but last year the first FIS Women’s Ski Jumping World Cup was held in Slovenia and it the event will be taking place again this month. The host town is Ljubno ob Savinji, a small town in the Upper Savinja Valley, which lies approximately halfway between the capital, Ljubljana, and the second city Maribor, and the town is synonymous with ski jumping. Continuing on the ski jumping theme, another major skiing event which takes place here annually in March is the Planica FIS World Cup Ski Jumping Final which is a crazy weekend full of sport and partying with a great atmosphere (or so I’m told anyway!). Although they didn’t win, the Slovene Handball team came in fourth place in the World Championships last week. It was disappointing to lose to Croatia but nevertheless it was the best ever result for the national team. Slovenia will also host the European Basketball Championships this year from 4th – 22nd September with matches due to take place in Ljubljana, Jesenice, Koper and Celje. Personally, being probably the world’s biggest chocoholic, I’m most looking forward to the Chocolate Festival to be held in April here in Radovljica. It was held for the first time last year and was so successful that this year it is going to be held over two days, rather than one – mmm, twice as much chocolate! There were a couple of days of beautiful winter sunshine this past week so I was, of course, out and about walking, with my crampons on of course as its rather icy in places now. At this time of year I often walk from home, either because I’m short of time or to save having to de-ice the car. An easy to reach destination, which offers great views for relatively little effort, is to Talež (725m). Talež is part of Jelovica, a vast plateau which dominates the view to the south side of Radovljica. The highest point of Jelovica is 1,411m and it is entirely covered by forest. There are numerous places to walk and it is also great for mountain biking BUT, a note of caution, it is huge and you could very easily get lost if you stray from the marked paths. The views from Talež across to Lake Bled and across the valley to the Karavanke Alps make it well worth the effort and there is a small hunter’s hut (pictured above) which offers drinks and home-made food (only open at weekends during the off-peak season). There are numerous routes up, none of which take longer than an hour, including those starting from the villages of Lancovo, Ribno, Selo, and Bodešče.